I have really been into the butternut squash and gorgonzola combo lately and it all started with the roasted butternut squash and caramelized onion pizza with gorgonzola and crispy fried sage that I made a while ago. While I was enjoying that pizza I thought that gorgonzola would also go really well with apples and I thought that an apple and gorgonzola pizza would also be really nice. The idea has been percolating in my head for a while and now that the apples are in season it was the perfect time to turn it into a reality. I figured that the soft gorgonzola dolce would melt really nicely and work as the ‘sauce’ of the pizza but it felt a little bare with just he cheese and the sliced apples. I borrowed the idea of adding the caramelized onions from the butternut squash pizza and I went with red onions to add a bit of colour. I also added a splash of balsamic vinegar to the onions for a kick of extra flavour. 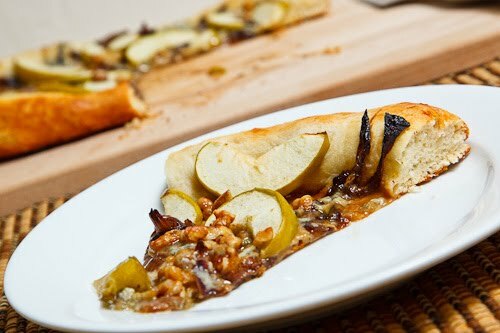 While researching apple pizzas on the web I came across one that used walnuts and the pizza was now complete. The apple and gorgonzola pizza with caramelized onions and walnuts turned out amazingly well! The gooey melted tangy gorgonzola worked really well with the tart apples and sweet caramelized onions and the walnuts added a great contrasting texture. Overall I was really pleased with the way the pizza turned out and I will definitely be making it again and again. Pear and gorgonzola is also a great combo and I think that a pear version of this pizza would also work really well. Add the onion and saute until tender and caramelized, about 15-20 minutes. Mix in the balsamic vinegar and cook until it has evaporated. Spread the onions, gorgonzola, apple and walnuts out on the pizza. A glorious dish! That combo is mouthwatering! Love the sweet & savory combination! I love this these combos! You could even drizzle a little honey over the top. YUM! I have been making pizza about once a week, and I am adding this one to my list! Sounds amazing Kevin. This flavor combo is incredibly versatile. It would also be fantastic as a tart or turned into a salad. Apples on pizza? Now that's something I've got to try. Delish!! I just made a pizza with apples this afternoon. I like this combo! Apple and cheese has got to be my favorite combo…to have it on a pizza……must have been heaven!!! You know the first time I tried Gorgonzola was on a pizza in Rome. It is my favorite topping now, even just on its own. I think apples would go great as you have done, the savory and sweet seems perfect. This is such an interesting pizza. I love this combination of toppings! such a delicious flavor combination!! Your combo look really pretty and delicious.Thanks for sharing! Oh my. What a creative pizza! Great picture too. Great pizza. That would be a success at any Holiday Party. Great sweet and savory combo. I just might try this with a variety of pears and apples to pump up the volume a bit. Very tasty pizza Kevin! Gorgonzola is the best on fruit pizza. I am always looking for new pizza combos–this sounds tasty!! I'm happy I came across this. I am thinking of making an apple and gorgonzola savory tart to bring to a holiday party and this is good inspiration.